Climate policy may be a minefield in U.S. politics, but the Pentagon sees liabilities of a different kind and is forging ahead with plans to reduce the military’s carbon footprint and prepare for climate impacts. 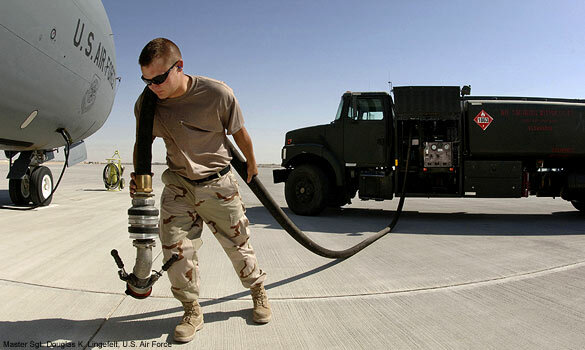 In my April feature for the Daily Climate, “Military sees threats, worry in climate change,” I cover how the Armed Forces are running on solar power and biofuels, aiming for net-zero energy use, and otherwise planning for energy security and climate change. Researchers suspect climate change could be an even greater catalyst than military planners have anticipated. Solomon Hsiang, a post-doctoral researcher studying social responses to climate change at Princeton University, linked large-scale climate patterns, such as El Niño, to a rise in civil conflicts. Hsiang and his colleagues determined that social unrest is 6 percent more likely to deteriorate into warfare during periods of El Niño activity, which tends to bring drought and extreme weather, such as cyclones and floods that slam the tropics. This periodic, global climate shift, which previews projected climate transformations, has played a role in one out of every five civil conflicts since 1950, making it as significant as any geopolitical or economic factor, according to Hsiang. The region’s major energy trade route runs just off the Yemeni shoreline, making it vulnerable to attack or blockade by pirates or other insurgent groups. “It’s seven miles from the Yemen coast to the shipping lane. You can row out, and you don’t even need an onboard motor,” said Neil Morisetti, a rear admiral in Britain’s Ministry of Defense and the U.K.’s climate and energy security envoy. Both stories have also been published online by Scientific American (here’s the feature and hotspot sidebar) and Mother Nature Network.